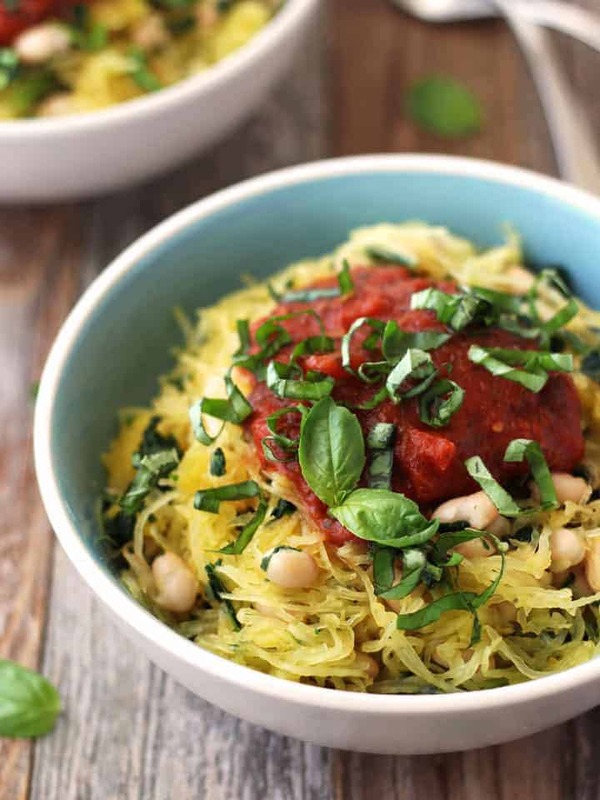 Your ultimate guide to easily cooking spaghetti squash in a toaster oven. 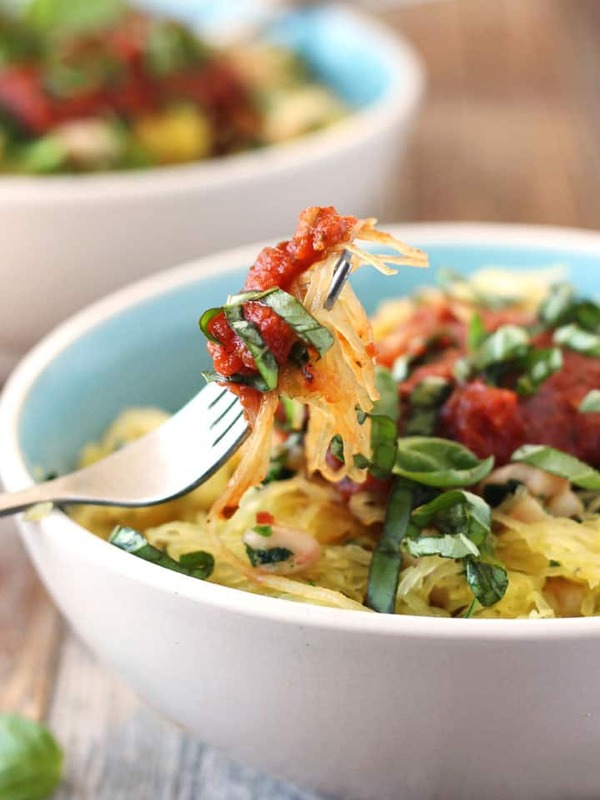 Enjoy a healthy veggie-filled bowl of buttery roasted spaghetti squash today. Why Roast A Spaghetti Squash? Browned caramelized tasty bits of flavor. You want all of that deliciousness and can easily achieve it by roasting your squash with the flesh exposed. Now, you’d also like to keep all of your fingers so slicing open a roll-everywhere-get-your-knife-stuck raw spaghetti squash seems like a dangerous gamble. 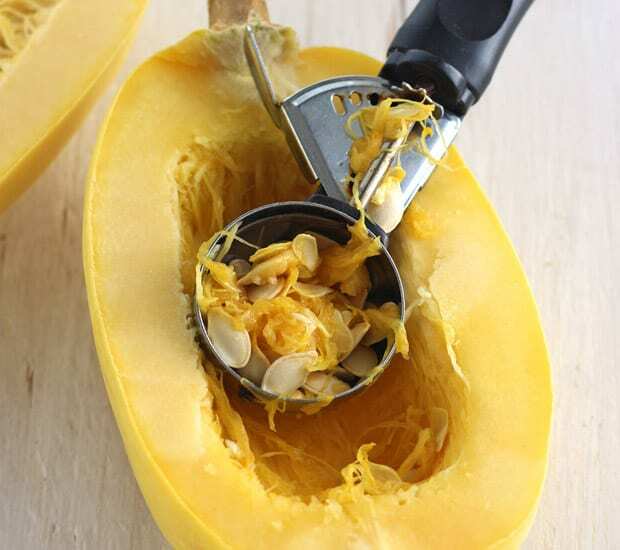 After years of terrifyingly trying to slice open raw spaghetti squashes, we discovered a simpler and safer way. Pre-cooking will soften your hard raw spaghetti squash. Then you can easily slide a knife through it and expose the flesh for seasoning and roasting. This can be done in your toaster oven as part of the regular cooking process or using your microwave oven. 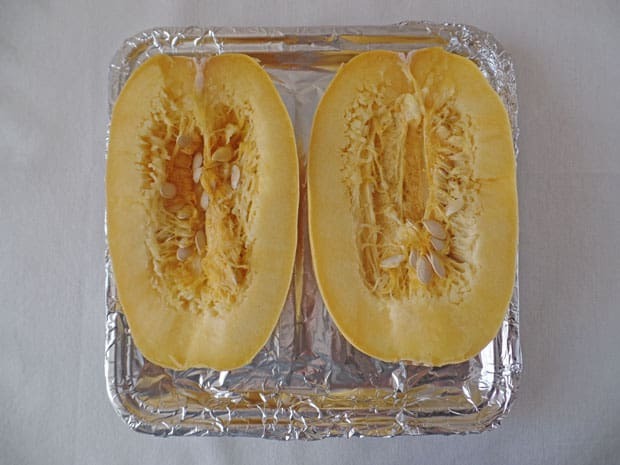 This method works great if your squash is too large or tall to place whole (unsliced) in your toaster oven. It will also reduce the final toaster oven cooking time to 30 or 35 minutes if you need to get your squash cooked faster. Stab your whole squash a few times all over (like you’re making a baked potato). Place on a microwave-safe plate and microwave for 5 to 8 minutes on high until a knife easily slides into it. If you hate scrubbing pans and want to cover your baking sheet or roasting pan with foil for easy clean up make sure to consult your manual first. Most manufacturers have specific instructions for the use of foil in their toaster ovens. Step 2. Wash and dry the outside of the spaghetti squash. Carefully stab the squash with a sharp knife at least twice on each side (similar to a baked potato, the steam needs a way to escape as it cooks). Carefully remove the squash and let cool for 10 minutes (make sure to leave the toaster oven on during this time). Step 4. Slowly slice open the squash lengthwise. Place a clean kitchen towel over the squash and lift the top half off (watch out for escaping steam) then place it back on the pan next to the bottom half. Step 7. Drizzle each side with olive oil, then sprinkle with salt, pepper and crushed red pepper (if using). Step 8. Turn both sides face down and return to the oven to roast for another 20-25 minutes (cooking time will depend on how large your squash is). Step 9. The squash will be ready when a fork slides into the back of the squash without any resistance. Step 10. Remove squash from oven, flip over and allow to cool for a few minutes before scraping the flesh into spaghetti-like strands. 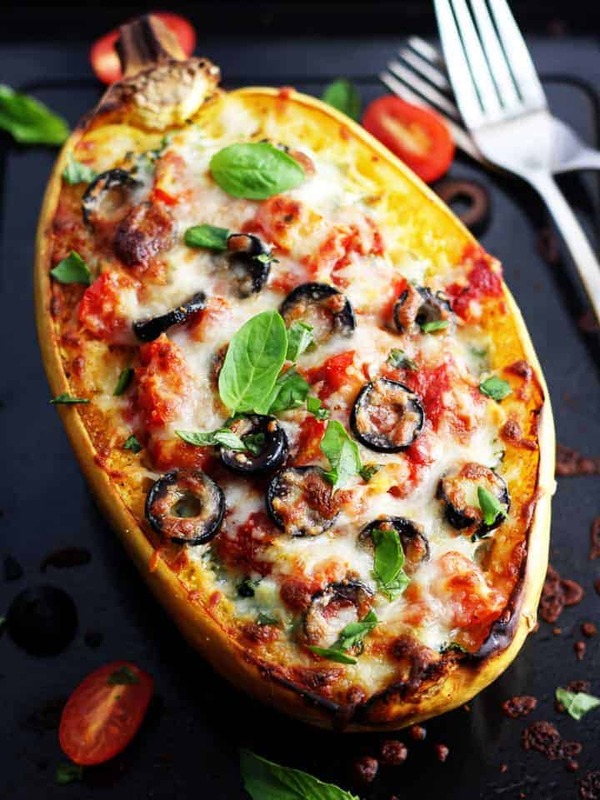 Enjoy your squash plain, mixed with your favorite pasta sauce or take things up a level with Veggie Pizza Spaghetti Squash Boats. When it comes to cooking spaghetti squash in your toaster oven knowing how large of a squash will fit is half the battle. So how to know what size to buy? Measure your pan and then pick a limb! Our old toaster oven’s roasting pan was 10 x 10. My forearm (from wrist to elbow) is about 8.5 inches so I always knew if I purchased anything longer than my arm I was taking a chance. Since you’ll be cutting the squash and placing the halves side by side you’ll need to pick a squash that’s not too wide. Make an “L” with your forefinger and thumb and measure the distance from tip to tip. My span is about 5 inches. So I needed to select squashes I could wrap my hands all the way around if I wanted them to fit our 10-inch pan. A Silly Way To Remember? Yep, but it’s the pits discovering a spaghetti squash you lugged home from the store is too big to be cooked in your toaster oven. Plus you’ll only need to get “handsy” with a few squashes. 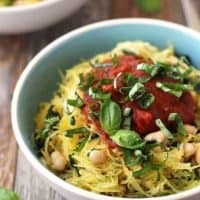 The more you cook with your toaster oven, the easier it will become to just eyeball what will or won’t fit and discover your favorite way to cook spaghetti squash in a toaster oven! 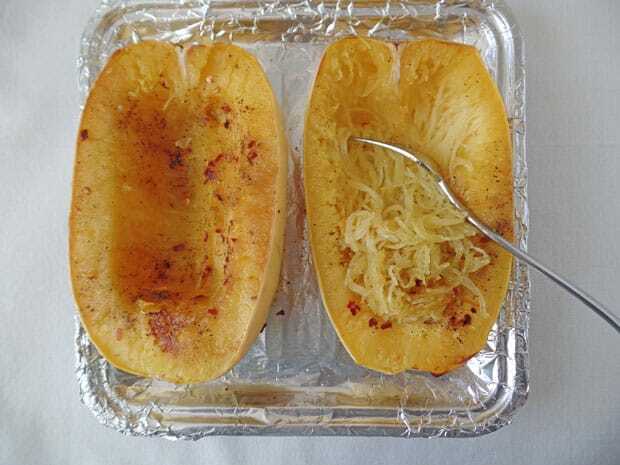 A perfectly seasoned full-flavored roasted spaghetti squash made in your toaster oven. Move your toaster oven's cooking rack to the lowest shelf position and preheat it to 425 F.
Wash and dry the outside of the spaghetti squash. Carefully stab the squash with a sharp knife at least twice on each side. 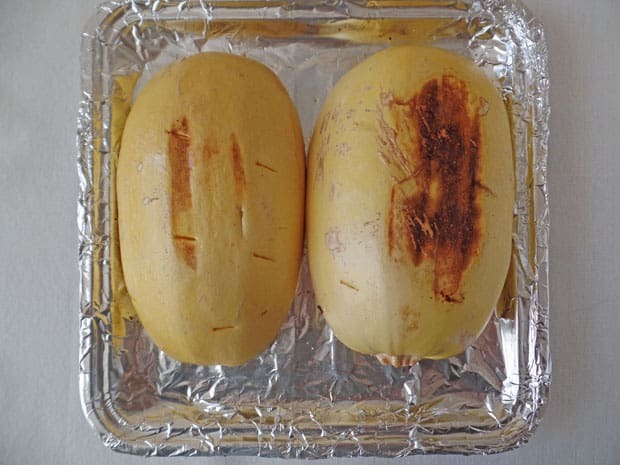 Place the whole squash onto a roasting pan and cook in the toaster oven for 25-30 minutes (Once a sharp knife slides in with just a little bit of resistance). 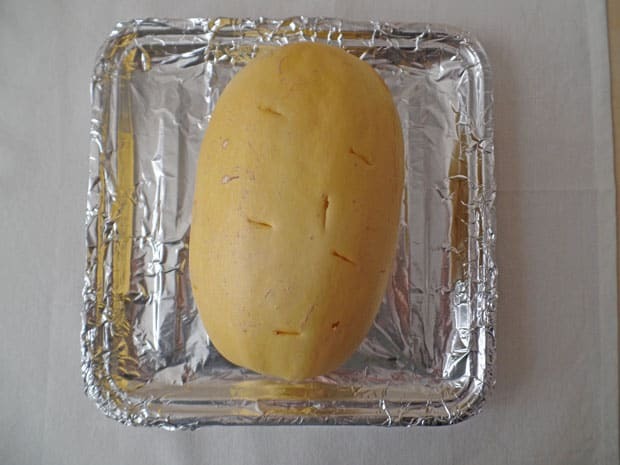 Carefully remove the squash and let cool for 8-10 minutes (make sure to leave the toaster oven on during this time). While the squash cools, gather the olive oil, salt, pepper and crushed red pepper. Slowly slice open the squash lengthwise, place a clean kitchen towel over the squash and lift the top half off (watch out for escaping steam) then place it back on the pan next to the bottom half. Drizzle each side with olive oil, then sprinkle with salt, pepper and crushed red pepper. Turn both sides face down and return to the oven to roast for another 15-25 minutes (cooking time will depend on how large your squash is). You will know it’s ready when a fork goes into the back of the squash without any resistance. Remove squash from oven, flip over sides and allow to cool about 10 minutes. Once cooled, scrape a fork lengthwise until all of the flesh has been removed. Taste the squash, salt, and pepper if you feel it’s needed and enjoy as-is or finish with your toppings of choice. 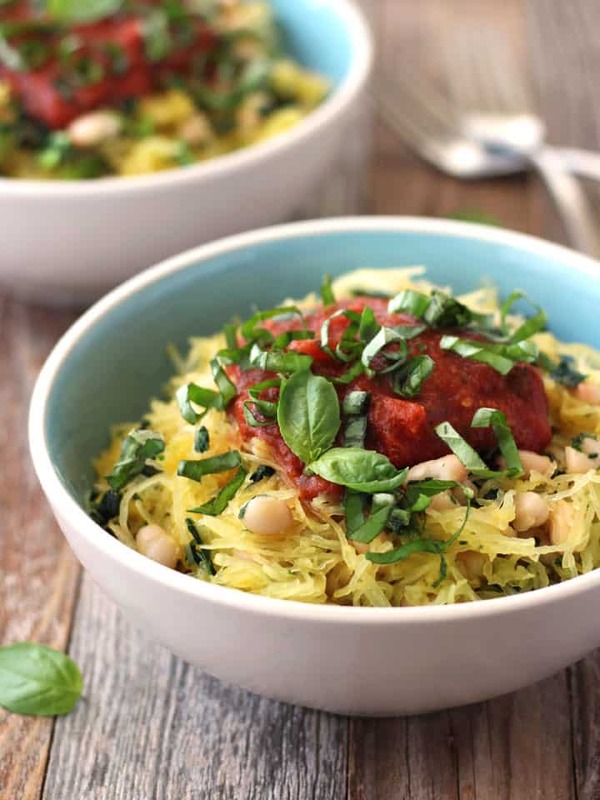 Nutritional Information is an estimate for 1 and 1/4 cup of plain roasted spaghetti squash. My daughter-in-law is a vegetarian and is raising my grandchildren vegetarians too. This recipe is wonderful! I am also alone and don’t need to use an oven to cook. Thank You for this recipe! Yay, that’s so awesome Carla! Hi Brie, Thank you for all your photos and yummy recipes!